We already know the history of the mounted games, as seen on the Pony Club Pizza HERE. Starting with an easy one, the mug shuffle is pretty simple. Equipment needed consists of 4 bending poles for each lane as well as two 12oz stainless steel mugs. Teams are required to split with two riders going to the opposite side of the arena. The lane is set with the mugs on poles one and three. At the signal the first rider moves cup one from pole one to pole two and cup two from pole three to pole four. This rider then tags off at rider two on the far end of the arena. Rider two moves cup two from pole four to pole three and cup one from pole two to pole one. And so on until all four riders have gone. It is a fairly quick game but is great when used as a warm up to get riders into the games ahead. Speed and precision are factors in this game. As with any of the games, dropped props have to be replaced before the next rider can go. Moving on, this game gets a little more involved requiring riders to dismount and remount their horses. This is where that good ol’ running mount comes in handy as well as a smaller horse or pony. Equipment needed consists of a 5 gallon water bucket and 5 old socks rolled up in a ball shape. They can be sewn together to keep them from unrolling. While teams consist of 4 riders, there is a reason for the 5th sock. The race starts where rider one starts with a sock and gallops down, leaning over and putting it in the bucket. This rider then continues on to the end of the arena where the rest of the socks are laid. They dismount, pick up another sock, remount and head back to their teammates. They pass off that sock to the next person on the team. That person does the same as the first rider. When they get to the fourth rider, who drops the sock they are given in the bucket, that rider must also grab another sock, dropping it in the bucket on the way home. 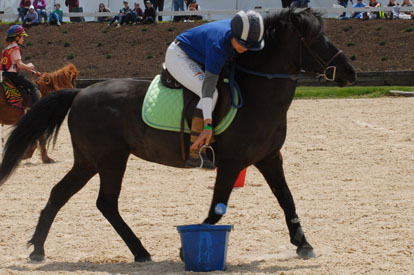 In this fashion, the fourth rider, also called the anchor rider, should have excellent hand-eye coordination as they have to drop two socks in the bucket. If riders have mastered placing things in a bucket, then naturally, the Two-flag race is a good progression. Equipment needed consists of two traffic cones, cut down to leave a 4” diameter opening and two 3’long flags. Wooden dowel rods are often used to create the flags with a piece of cotton cloth added to one end. This is another race like the Mug Shuffle where teams split. Two riders from the team must go to the opposite end of the lane. Rider one starts with a flag in hand. This rider gallops to the first cone and places the flag (cotton cloth side up) in the cone. They then continue to cone two (where the second flag is sitting) and grab that flag carrying it to rider two at the far end of the arena. Rider two heads back down the lane placing the flag in the first cone they come to and picking up the second flag. The last rider finishes with a flag in hand. This race requires much more precision and balance from both horse and rider as it is easy to miss placement of the flag while galloping at top speed. It’s a lot faster to actually get the flag placed then missing and having to dismount to get the flag off the ground and try again. Through the hula hoop and get back on! This race, while needing less equipment is a little more confusing to explain. The only equipment needed is a hula hoop placed on the centerline of the lane. Riders will go in pairs for this race. Only one rider, rider number three must go to the other end of the lane. To start riders one and two ride down the lane together. 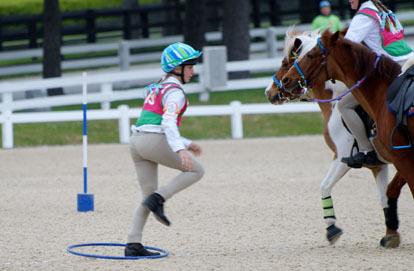 Rider one dismounts and steps through the hula hoop while rider two holds their pony. After they are through the hoop, rider one then remounts and both continue to the end of the arena. This is where it gets interesting. Rider one is now the only rider at the far end of the lane. Rider two and three head back down the lane. Rider two dismounts while rider three holds the horse, rider two picks up and goes through the hoop, remounts and both head back to the other end of the arena. This continues until all four riders have both held ponies and stepped through the hula hoop. This race requires riders to mount and dismount as well as be able to hold on to a friend’s mount while they take their turn. It is a true display of teamwork while riding. 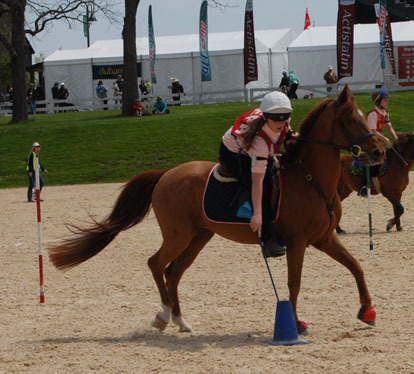 These are just four of the many games played at Pony Club games competitions. 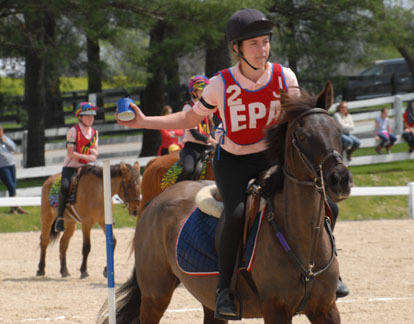 Games are a great way to create more comradery and teamwork between Pony Club members. They are interesting and fun to participate in as well as usually providing for some laughs when things go slightly awry. For more information and rules for Pony Club games click HERE. Get your game on!